Ahead of their graduation, almost half of the pioneer batch from Singapore's first liberal arts college have secured jobs. Another one-fifth have received offers to pursue graduate studies. This, say observers, indicates that employers here believe in the value of a liberal arts education, though it is still viewed by many as a "minority" option. An autonomous college of the National University of Singapore, Yale-NUS was established in 2011 and admitted its first batch of students in 2013. At its first graduation ceremony yesterday, it announced that 63 per cent of its 119 graduates had already obtained job or graduate school offers. This is in line with that of newer institutions such as the Singapore University of Technology and Design (SUTD). More than two-thirds of SUTD's pioneer batch in 2015 had offers from employers and graduate schools before graduation. A fuller picture of the graduates' employment statistics will emerge later. Yale-NUS College will be participating in the Ministry of Education's graduate employment survey, typically conducted in November. Among the Yale-NUS graduates who have already found work, one quarter will be in government as public servants. Another quarter will go into consulting. 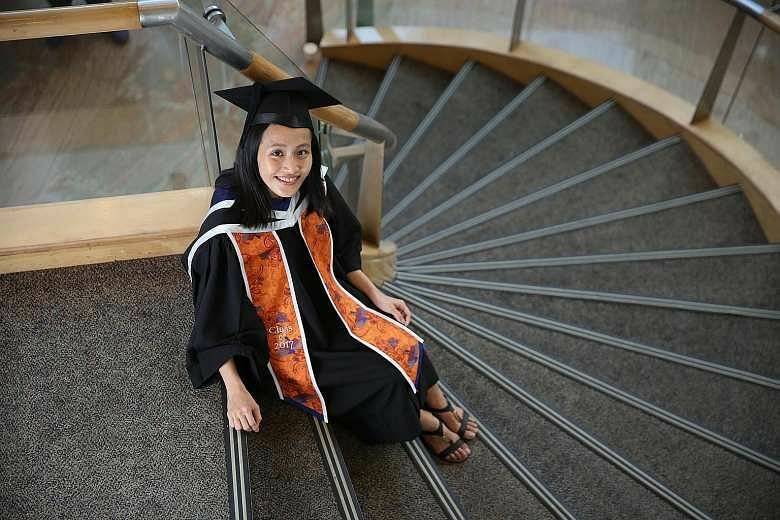 Ms Chua Wan Ping, 23, went into Yale-NUS College in 2013, thinking that she would probably major in literature. But an introductory class in her freshman year convinced her to take up environmental studies, when it opened her eyes to how environmental changes can impact societies, and the disproportionate amount of power institutions can wield over consumption patterns. "The issues that we discussed were urgent and important, and the subject aligned with my passions," said Ms Chua, who developed an interest in global food systems and sustainable agriculture. Yale-NUS students declare their majors at the end of year two. During her four years at the college, Ms Chua spent a semester abroad at Yale University, helped found an online portal to connect environmental stakeholders in Singapore, and went on a learning trip to Sarawak, Malaysia, to find out about palm oil and hydro dam development and their impact on native communities. In July, she joins Heineken as a management trainee, where she will work in corporate relations, including sustainability policy. Another Yale-NUS graduate, Mr Chua Yao Hui, 26, will join online marketplace Carousell as a software engineer. He switched from economics to mathematical, computational and statistical sciences late in his third year. "Thanks to the flexibility of the Yale-NUS curriculum, I was able to... develop a sound grasp of algorithmic problem-solving and software engineering principles in time for graduation," he said. Other popular options include becoming teachers, engineers or working in sectors such as communications and technology. Those going on to further studies have been accepted into institutions such as Cornell University and China's Tsinghua University. At the ceremony, Education Minister (Higher Education and Skills) Ong Ye Kung said the college has come a long way from 2008, when plans for its establishment were first mooted. He added that the liberal arts, as the "purest form of multidisciplinary education", occupies a special place in Singapore's higher education landscape. "We all know the saying about not giving a man fish, but teaching him how to fish. In that sense, a liberal arts education is the ultimate fishing rod." But he also noted that such an education model is not for everyone. "Within our higher education landscape, we need to maintain a plurality of options to suit different interests, aptitudes, styles of learning." President Tony Tan Keng Yam, who is the NUS chancellor, and Yale University's president emeritus Richard Levin were also present at the ceremony. National Institute of Education don Jason Tan said it is admirable that 63 per cent of the Yale-NUS' pioneer cohort have secured job or academic offers at this stage. "It serves as testament to the value of such a liberal arts programme, which is still viewed as a minority option in Singapore and many parts of the world. "It is quite a pity as the skills that (a liberal arts education) inculcates are broad, generic skills that every student needs to cope with the rapidity of change in today's world."